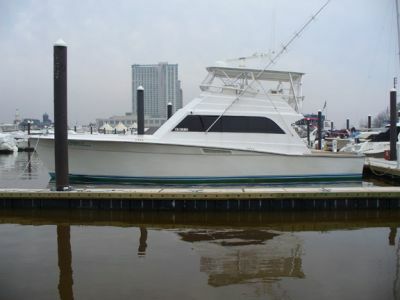 Before and after photographs of the boat. 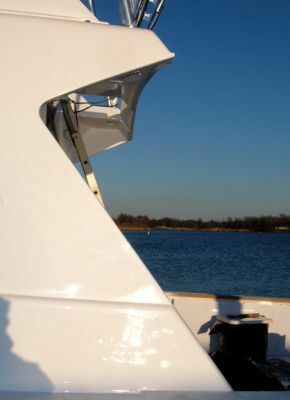 This photograph shows the profile of the boat before the extension was added. 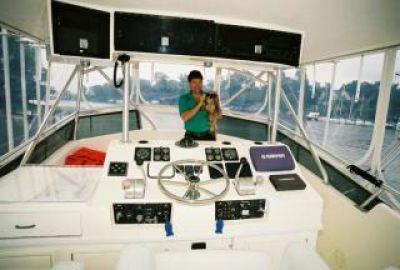 We felt she looked "cut off" and the cockpit was small for a boat her size. 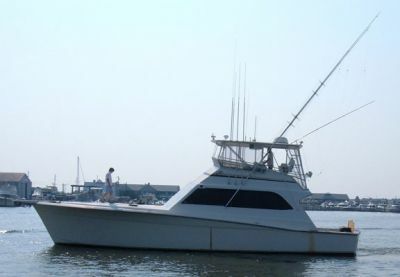 In addition we wanted a fish-box in the gunnel that would take more needed space. After: We feel that she now looks in proportion. 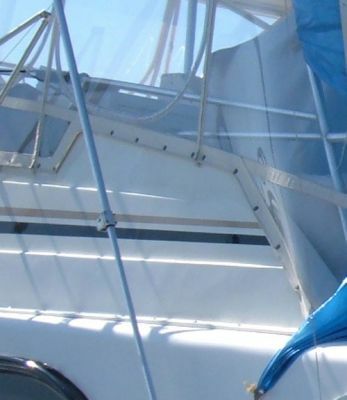 Note the new vent in the hull. Also note the new look the hard-top gives. The House Before: Large bulky trim and big curve. House After: Trim removed and new shape cut giving her a clean look. 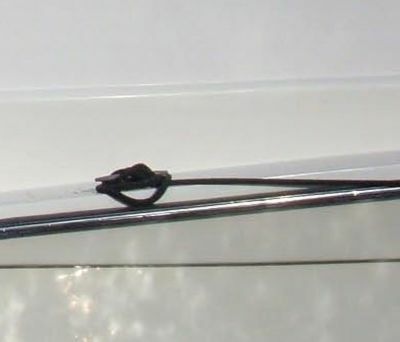 Transom Before: Hawse pipes showing, no personality plain white. 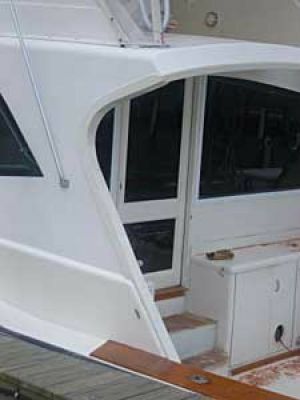 Transom After: No hawse pipe in the transom and there is now a 3/4" mahogany face on the new fiberglass extention. 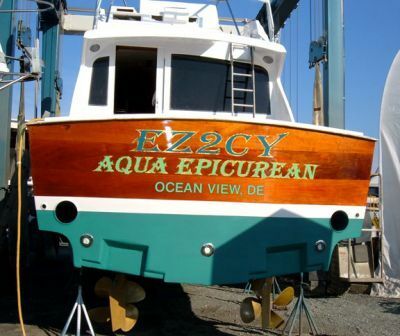 Sixteen coats of varnish make her shine. Now she has class! 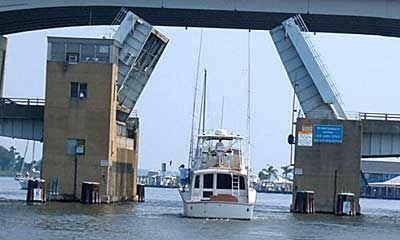 Bridge Sides Before: The three horizontal edges shown hold water from rain, washing and or seas that create water spots and make it a requirement to squeegee each of them. Further, the bottom edge that secures the bridge has screws every 6" and is not clean looking. 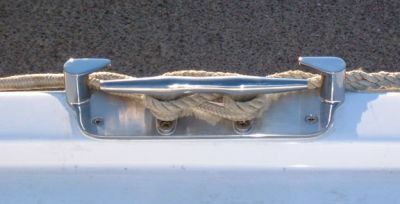 Cleat Before: The cleat allowed the lines to rub on the boat. The cleat was too small and the chrome was peeling off the bronze. 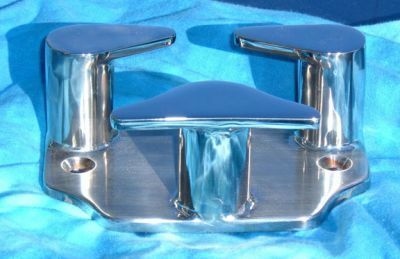 A new stainless cleat mounted on the cleat plate we designed and had fabricated by Canvas Designers. 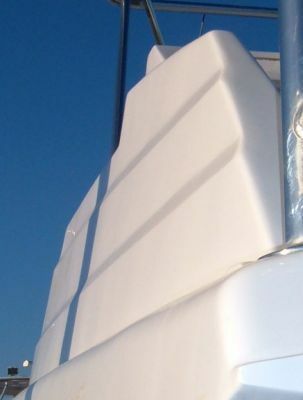 The cleat plate raises the lines up and brings them out to the edge so they will not rub the boat's new paint. 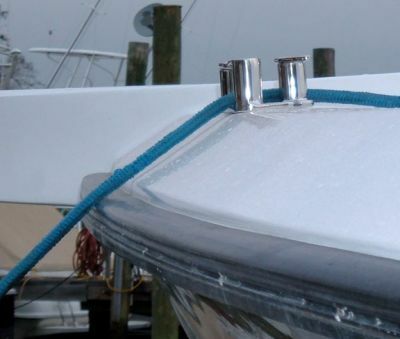 This is the bow chock we designed. It gives you two choices of direction to run the line. The line is easily placed in the chock and as long as you chose the right direction, the line will not pop out. 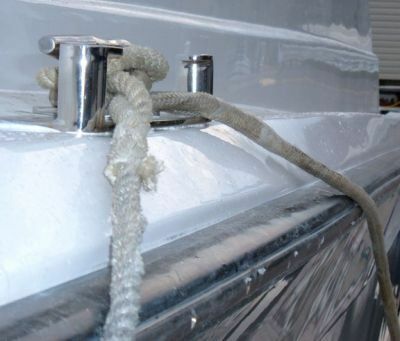 This new bow chock also keeps lines off of the boat's paint similar to the function of the cleat plates. 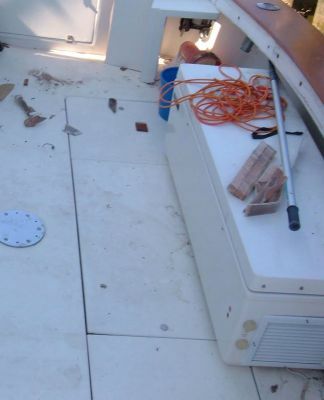 Hawse Pipe Before: The hawse pipe is in the transom and not large enough for 50 amp power cord to fit through. 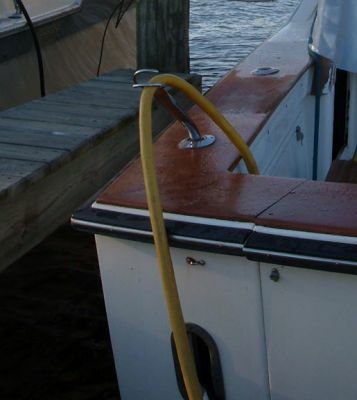 We found it a pain to try and feed lines through and we did not want the Hawse located in our new Varnished Mahogany transom. Hawse Pipe After: We designed and had this stainless Hawser fabricated. The flush fit is clean, the hole is large enough for a 50 amp cord/lines/hose and the key-way makes using it very easy. 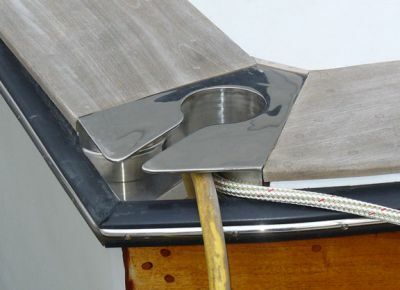 The design allows for lines to go either forward or across while not allowing them to touch the paint or rub on the teak. The limp lines are easily dropped in rather than having to be fed. We are very pleased with this change! 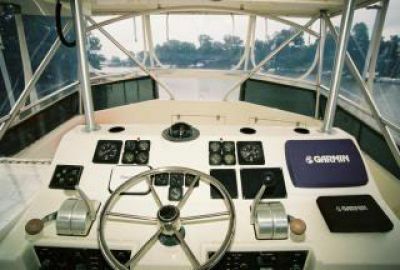 Console Before: Radar, radio, loran, sonar, etc. were located in upper box. To see these instruments you had to bend your neck and take your eyes away from your course. 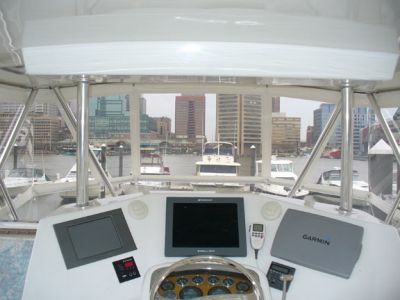 The plotter was located in the console to the right and you almost had to leave the helm to view/use it straight on. 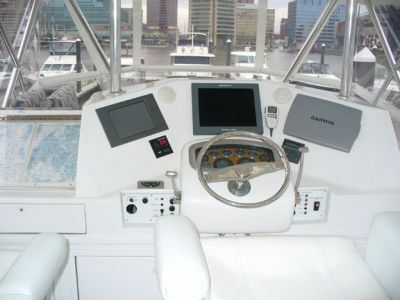 The flat map area prohibited the captain from seeing properly and the person sitting up front had only a 4" back support. Console After: Every instrument is easily reached and can be seen straight on with only the slightest tilt of the head. The pod helm brings the wheel out to a more comfortable position and is flanked by single lever controls. The map area to port was raised for a better viewing angle and giving back support for those sitting in front of it. Instrumentation Before: Instruments are spread out and read metric/US making it jumbled and confusing. In addition the faces are hazy. 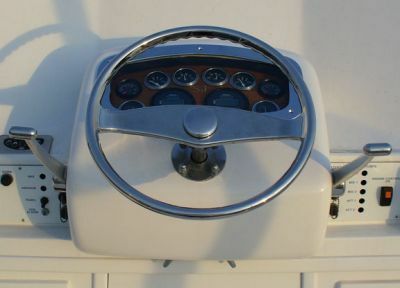 Fuel gauges and rudder angle indicator are directly in front of wheel. Instruments After: Vital instruments are now "at a glance". All instruments only read US! 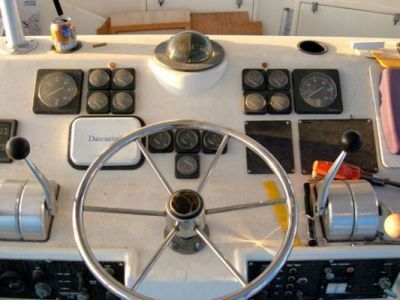 FloScan Tachs are front and center and are flanked by transmission pressure gauges. Top center is temperature, next is oil pressure. Following that are Pyrometors, a new addition that will help monitor engine stress. Volt/amp will now be read on the E-Plex screen as will fuel levels. In fact, with E-Plex, we will be able to read fuel levels from the monitor in the Master Stateroom too. Pipe/Enclosure Before: Pipes going everywhere at every angle. Why the pipe 2" above the Venturi? Why that curved piece at the top? U-zips and distortion abound. Pipe/Enclosure After: Clean! No distortion, no pipe in corner, no pipe above Venturi and no curved piece at top. Just Clean! 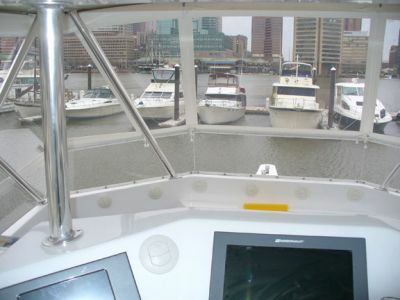 Venturi Before: The tinted shade made it very difficult to see in some of the most important areas and you had to look through the enclosure since it was snapped to the boat below the Venturi. Venturi After: Clear all around. Track for the enclosure is mounted at the top making it easy to keep clean and giving it a clean look. Fish Box Before: In the deck box made it hard to get to anything below, difficult to drain and back-breaking to empty. In addition, when the chair is mounted the box would be very awkward to get to.